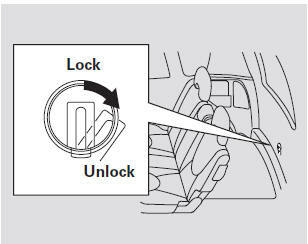 The tailgate will lock or unlock when you lock or unlock the driver’s door by using the key, the lock tab on the driver’s door, the master door lock switch or the remote transmitter (if equipped). You can lock or unlock the tailgate with the key. 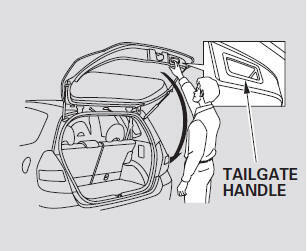 To open the tailgate, pull the handle, then lift up. 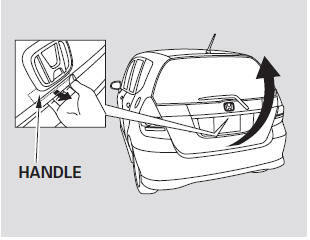 To close the tailgate, hold the tailgate handle, lower the tailgate, then press down on the back edge. Keep the tailgate closed at all times while driving to avoid damaging the tailgate and to prevent exhaust gas from getting into the interior. 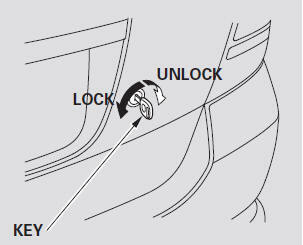 If the power door lock system cannot unlock the tailgate, unlock it manually. Place a cloth on the edge of the cover, then use a small flat-tipped screwdriver to remove the cover on the back of the tailgate. 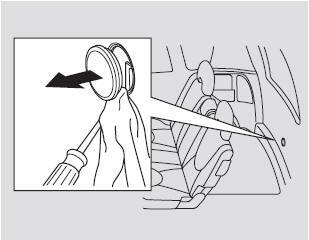 Push the release lever to the right as shown. If you need to unlock the tailgate manually, it means there is a problem with the tailgate. Have the vehicle checked by your dealer.